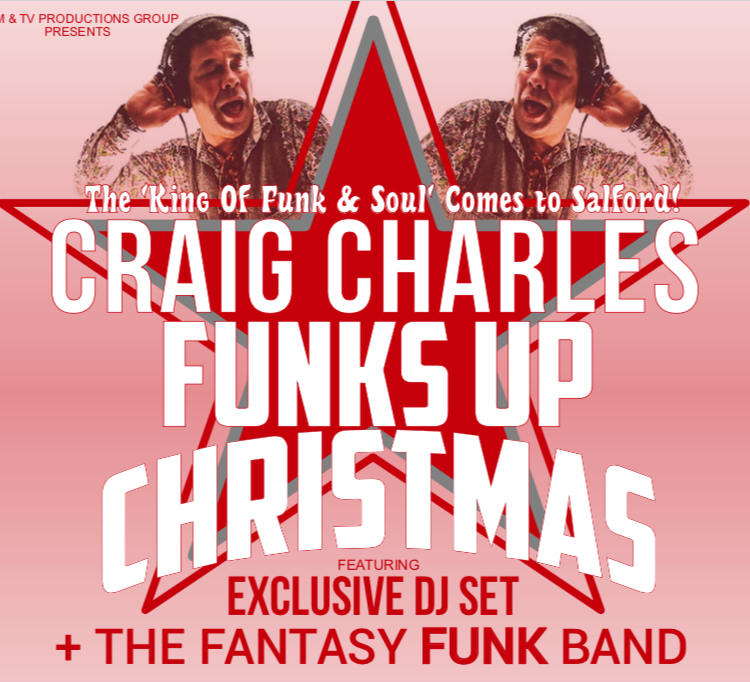 Join one of the best loved funk and soul DJs: Craig Charles as he ‘Funks Up Christmas’ with a special Christmas gig on December 4th at The Lowry theatre in Salford Quays. The legendary actor, broadcaster and host; CRAIG CHARLES (Red Dwarf, Robot Wars, Coronation Street, BBC Radio 2) invites you to his Christmas party for the ultimate funk and soul experience featuring an exclusive Craig Charles DJ Set and a number of famous guest performers. Special guests joining Craig Charles for his ‘Funked Up Christmas’ include Soul legends; THE REAL THING performing their multi-million selling number one singles; ‘You To Me Are Everything’, ‘ Can’t Get By Without You’ and ‘Feel the Force’. Direct from the USA; Disco stars, ODYSSEY also join the ‘Funks Up Christmas’ line up performing a hit filled set including ‘Use it Up & Wear it Out’,’Native New Yorker’, ‘Inside Out’ and the iconic disco anthem: ‘Going Back to My Roots’. Original Northern Soul Singer; LORRAINE SILVER who shot to fame performing in the iconic Soul Clubs like ‘Wigan Casino’ and the ‘Twisted Wheel’ will be performing her northern soul classics; ‘Long After Tonight Is All Over’ and ‘Lost Summer Love’. Following rousing performances in front of thousands of festival goers in London’s Hyde Park,Glastonbury and The Big Chill Festival, THE CRAIG CHARLES FANTASY FUNK BAND complete the special guest line up for ‘Funks Up Christmas’ in Salford – a super band if you will, the band was created by Craig Charles when he asked his radio listeners to vote for the perfect funk band line up; the result IS the Fantasy Funk Band who are now famous for giving spellbinding funktastic performances! Craig Charles will close the evening with one of his trademark unbelievably funky DJ Sets, known for being ‘the king of Funk and Soul’ – He knows how to get the party going and after years of sell-out DJ Sets at festivals and venues around the world, Craig Charles expressed his excitement ahead of performing his ‘Funks Up Christmas’ show in Salford Quays; ‘This is going to be a thumping gig, I can’t wait to play to the Salford crowd, playing the tunes and having a right good party’. Craig Charles Funks Up Christmas comes to The Lowry on December 4th , Tickets are available at: www.thelowry.com or by calling the booking line 0843 208 6010.